Song info: Lyrics by Ringo, produced by Yasutaka Nakata (CAPSULE). Notes: “Netsuai” (passion, ardent love) is a word commonly used in Japanese tabloids when images of a new couple have surfaced and the gossip is about this previously unknown couple’s new secret romance. (There were articles like that about Ringo and the father of her second child, Yuichi Kodama.) “Hot and cold”, a translation of tsundere; Epsilon, Epsilon rocket; IOC, International Olympic Committee (around the time this song was released, Tokyo had just won its bid to be the host for the 2020 Olympics); CRP, C-reactive protein. Info: Written by Burt Bacharach; performed by Ringo Shiina & the Neko Saitou Quartet. Song info: Performed by TOWA TEI with Ringo Sheena. Lyrics by Towa Tei. Translator’s notes:  This is a reference to Hijou no License, a drama series that was popular in the 70s. For any other Americans, 40 degrees Celsius is 104 degrees Fahrenheit, or a high fever. Song info: Lyrics by Ringo, performed by Soil & “Pimp” Sessions featuring Ringo. Song info: A previously unreleased song released on Tokyo Jihen’s B-side album “Shinya-waku” [The Late-Night Frames] (original Japanese: 深夜枠). Song info: A previously unreleased song included with the Tokyo Collection (original Japanese: 東京コレクション) album of highlights from past live shows. This song was recorded during the “Discovery” tour, on December 7, 2012 at Tokyo International Forum A. Song info: A previously unreleased song included with the CS Channel music video collection. Song info: Performed by Rekishi feat. Deyonna (Ringo). Lyrics by Takafumi Ikeda. 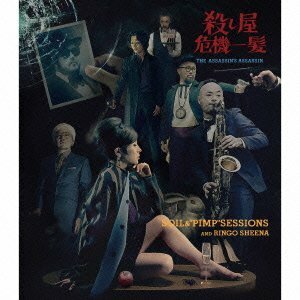 Song info: Ringo produced and wrote the music and lyrics to this song, sung by Chiaki Kuriyama and performed by Tokyo Jihen. It was released on her Oishii Kisetsu/Ketteiteki Sanpunkan single (original Japanese: おいしい季節/決定的三分間) and subsequent Circus album. Are you feelin’ a change in the air? Don’t you always think of me? Info: Performed by Soil & “Pimp” Sessions featuring Ringo. There are two versions of this song, “MY FOOLISH HEART ~crazy on earth~” (which first appeared on the band’s 2009 album 6) and “MY FOOLISH HEART ~crazy in shibuya~”.